You’ve heard it a million times: “offense gets headlines, but defense wins championships.” The 2011 Oklahoma Sooners are once again going to try to defy that tried-and-true logic as they hope to ride one of the most prolific attacks in college football to another shot at the BCS Championship. Oklahoma will likely begin the 2011 college football betting season as the No. 1 team in the country. They have the horses and the schedule to find themselves in the BCS Championship Game for the fourth time in eight years. But they are 0-3 in their last three championship game appearances and the Sooner Nation has to be getting a little restless. Bob Stoops is the unquestioned leader of a strong coaching staff. He has been at OU for 12 years and has compiled an impeccable 129-31 record during that time. However, Oklahoma is one of the few (or maybe the only) teams in the country that employs co-coordinators on both offense and defense. Josh Heupel and Jay Norvell lead the offense while Bret Venables and Bobby Jack Wright are co-defensive coordinators. I’m sure it works out very well and everyone knows his role. But it just strikes me as odd; something about “too many cooks” comes to mind. Nasty. That’s really the only way to describe the Oklahoma offense. They can essentially score at will and bring back the quarterback, two all-American receivers, and four of five offensive linemen from a team that tallied 37.2 points per game last year. Oklahoma did suffer some key losses. Specifically, the graduation of leading rusher DeMarco Murray hurts. But they will more than be able to weather that loss thanks in part to freshman sensation Brandon Williams. He will lead a running back group that, while not experienced, is certainly capable of keeping defenses honest and providing some big plays. OU didn’t do a very good job of generating big plays in the running game last year (they only had nine rushes of 20 yards or more), and that is something they can improve. Where they don’t need improvement – just continued excellence – is in the passing game. All-American Ryan Broyles caught 131 passes in 14 games last year (yes, you read those numbers right) and is as good as anyone in the nation. He is complimented by Kenny Stills, a freshman all-American who contributed 61 catches. There is depth behind that duo, and OU can spread the field with playmakers as well as anyone in the nation. That leaves it all up to Landry Jones. He made tremendous strides as a sophomore and is now in this third year as the Oklahoma starter. Last season he threw for 4,700 yards and 38 touchdowns. But now he needs to take that next step beyond the numbers and show that he can lead – nay, will – this team to victories as a veteran signal caller. The numbers don’t always tell the tale for the Oklahoma defense. Because the offense scores so many points, so quickly, that means that the OU defense is left to face desperate teams trying to throw the ball and drag out games. That can sometimes skew the yardage numbers, and they were mediocre (No. 53) in terms of yards allowed. But was still in the top quadrant of college football in terms of points allowed (No. 33 nationally at 21.8 points per game allowed). Unfortunately, tragedy struck the team this summer when starting middle linebacker Austin Box died from a painkiller-related overdose. It is tough to even talk about how this will impact the team schematically, but the fact of the matter is that they lost a good teammate and an excellent player. But hopefully they can harness the emotion of his loss and pay tribute with their play on the field this season. That leaves three-year senior starter and all-Big 12 linebacker Travis Lewis as the heart and soul of the defense. He is one of seven returning defensive starters and, along with Jamell Fleming, represents the top talents on this group. They have three of four starters back on the D-line, and both corners are ready to roll. However, the reality is that this team was No. 58 in rushing defense and No. 51 in passing defense. That’s good enough to roll through the defense-optional Big 12. But can this team get stops against other top-tier offenses? Are they good enough to hold the fort when Landry and the Sooners attack have an off night? And can they get stops and/or force turnovers if this team falls behind? A note to anyone hoping to derail Oklahoma’s path for the BCS Championship Game: you better get them early. Oklahoma’s schedule really softens up after the first month or so of the season, and after the Red River Shootout (I don’t care how they try to rebrand it) on Oct. 8 I think there are only two games – at home against Texas A&M on Nov. 5 and at Oklahoma State in the season finale – that the Sooners have any realistic chance of losing. They should be double-digit favorites in the rest. 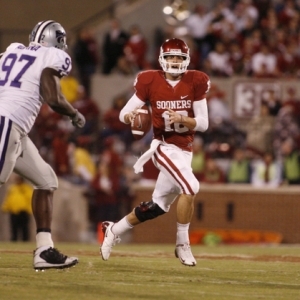 However, there are a few tricky steps early in the season that could trip up OU. On Sept. 17 (after a bye week) the Sooners head to Tallahassee to take on Florida State. The Sooners lost in their last trip to the Sunshine State, dropping a 21-20 decision to Miami in 2009. That is also a big revenge spot for the Seminoles after getting mounted last year in a 47-17 loss in Norman. The week after that game with FSU the Sooners return home to face Missouri. The Tigers (somehow) topped Oklahoma last year with College Gameday on hand and that’s a revenge spot for the Sooners. But Missouri could potentially catch them off guard. Beyond that only the RRR game with Texas in Dallas stands in the way of the Sooners and an unbeaten Big 12 slate. Perhaps the most important part of Oklahoma’s schedule this year is the game they won’t be playing: there is no Big 12 Championship Game this year. That is one less impediment for what is clearly the most talented team in the nation’s No. 2 conference. WagerWeb has the Sooners as heavy favorites to win the Big 12 (-250). At 5-to-1, Bodog has Oklahoma as one of the favorites to win the BCS National Championship. Reasons why the Sooners won’t find a place in the BCS Championship Game are pretty few and far between. They haven’t lost at home since 2005 and they have only lost in Norman twice in the last decade (61-2 straight up, 34-26-1 against the spread). So the odds are that they only have one or two games this year where they may be threatened. But the question isn’t whether or not the Sooners can get to the title game. The issue for them, after losses in 2004, 2005 and 2009, is whether or not they can get back over the hump and secure their first championship win since their stunning upset of Florida State in 2001. I feel like the Sooners can win it all, but I definitely won’t predict that they will. I still don’t have complete faith in their defense, and when it comes right down to it they have to prove that they can get big stops against great teams when it matters. No one doubts their offensive ability. But they don’t have a proven rusher and they have only five seniors among their starting 22. But we’re kind of nitpicking. At this point the 2011 Oklahoma Sooners may be the only thing standing between the SEC and another national championship. And I think that the Sooners have the ability to make it to the title game, but I’m not willing to predict them getting over the hump. Robert Ferringo is a professional and college football handicapper and is coming off an exceptionally profitable 2010-11 football picks season (college and pro). Over the last year his clients have more than tripled their bankrolls with his predictions in all sports. He is looking forward to building on his stellar football handicapping resume again this fall and you can check him out here.